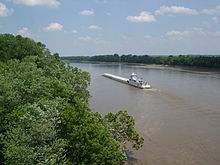 ^ a b c d e f "Missouri River". Geographic Names Information System. United States Geological Survey. October 24, 1980. Retrieved May 6, 2010. ^ a b Nell, Donald F.; Demetriades, Anthony. "The True Utmost Reaches of the Missouri: Were Lewis and Clark wrong when they identified the source of this great river?". Montana Outdoors (2005–07 to 08). Retrieved January 14, 2012. ^ "Madison Lake". Geographic Names Information System. United States Geological Survey. April 4, 1980. Retrieved January 21, 2012. ^ a b c d e f g h "USGS Gage #06934500 on the Missouri River at Hermann, Missouri: Water-Data Report 2009" (PDF). National Water Information System. U.S. Geological Survey. 1897–2009. Retrieved August 24, 2010. ^ a b Howard Perlman, USGS (October 31, 2012). "Lengths of major rivers, from USGS Water-Science School". Ga.water.usgs.gov. Retrieved November 21, 2012. ^ a b c U.S. Geological Survey. "United States Geological Survey Topographic Maps". TopoQuest. Retrieved May 8, 2010. ^ a b c d e f g h i j k USGS Topo Maps for United States (Map). Cartography by U.S. Geological Survey. ACME Mapper. Retrieved May 8, 2010. ^ "USGS Gage #06185500 on the Missouri River near Culbertson, MT" (PDF). National Water Information System. U.S. Geological Survey. 1941–2010. Retrieved July 4, 2011. ^ "USGS Gage #06329000 on the Yellowstone River near Sidney, MT" (PDF). National Water Information System. U.S. Geological Survey. 1911–2010. Retrieved July 4, 2011. ^ "Missouri River". Columbia Environmental Research Center. U.S. Geological Survey. September 8, 2009. Retrieved May 10, 2010. ^ "North America". Encyclopædia Britannica. Retrieved May 10, 2010. ^ a b c d e f g h i j k "Boundary Descriptions and Names of Regions, Subregions, Accounting Units and Cataloging Units". U.S. Geological Survey. Retrieved March 5, 2011. ^ "USGS Gage #07010000 on the Mississippi River at St. Louis, Missouri: Water-Data Report 2009" (PDF). National Water Information System. U.S. Geological Survey. 1861–2009. Retrieved August 24, 2010. Note: This gauge is just below the Missouri confluence, so the Missouri discharge was subtracted from 190,000 cubic feet per second (5,400 m3/s) to get this amount. ^ a b c d e f g h i j k l m n o "Missouri River Mainstem Reservoir System Master Water Control Manual". U.S. Army Corps of Engineers. University of Nebraska Lincoln Digital Commons. January 1, 2006. Retrieved January 15, 2012. ^ Crane, Gabe (2007). "Wyoming Metropolis?". Next American City. Archived from the original on December 11, 2010. Retrieved January 17, 2012. ^ DeFranco, Anthony (June 27, 1994). "No More Floods! Build The Missouri River Development Project" (PDF). New Federalist American Almanac. 21st Century Science and Technology. Retrieved January 17, 2012. ^ "Mount Lincoln, Colorado". Peakbagger. Retrieved May 21, 2014. ^ "Elevations and Distances in the United States". Eastern Geographic Science Center. U.S. Geological Survey. April 29, 2005. Archived from the original on October 15, 2011. Retrieved October 8, 2010. ^ Carter, Janet M.; Williamson, Joyce E.; Teller, Ralph W. "The 1972 Black Hills-Rapid City Flood Revisited". U.S. Geological Survey. Retrieved January 15, 2012. ^ a b c d "Watersheds (map)". Commission for Environmental Cooperation. 2006. Archived from the original on April 14, 2008. Retrieved September 12, 2008. ^ Gonzalez, Mark A. (2003). "Continental Divides in North Dakota and North America". North Dakota Geological Survey Newsletter. The National Atlas. Archived from the original on May 13, 2008. Retrieved January 14, 2012. ^ "Great Divide Basin". Wyoming State Geological Survey. Retrieved March 16, 2011. ^ Stone, Clifton. "Missouri River". The Natural Source. Northern State University. Retrieved July 10, 2011. ^ a b c Kammerer, J.C. (May 1990). "Largest Rivers in the United States". U.S. Geological Survey. Retrieved March 5, 2011. ^ a b "USGS Gage #06805500 on the Platte River at Louisville, NE" (PDF). National Water Information System. U.S. Geological Survey. 1953–2009. Retrieved March 5, 2011. ^ a b c d e f g h i j "The National Map". U.S. Geological Survey. Archived from the original on April 5, 2012. Retrieved March 5, 2011. ^ "USGS Gage #06892350 on the Kansas River at DeSoto, KS" (PDF). National Water Information System. U.S. Geological Survey. 1917–2010. Retrieved March 5, 2011. ^ "USGS Gage #06174500 on the Milk River at Nashua, MT" (PDF). National Water Information System. U.S. Geological Survey. 1940–2010. Retrieved March 5, 2011. ^ "USGS Gage #06478500 on the James River near Scotland, SD" (PDF). National Water Information System. U.S. Geological Survey. 1928–2009. Retrieved March 5, 2011. ^ Miller, Kirk A. (1999). "Surface Water". Environmental Setting of the Yellowstone River Basin, Montana, North Dakota, and Wyoming. U.S. Geological Survey. Retrieved March 6, 2011. ^ a b "USGS Gage #06452000 on the White River near Oacoma, SD" (PDF). National Water Information System. U.S. Geological Survey. 1928–2009. Retrieved March 5, 2011. ^ "USGS Gage #06465500 on the Niobrara River near Verdel, NE" (PDF). National Water Information System. U.S. Geological Survey. 1928–2009. Retrieved March 5, 2011. ^ "USGS Gage #06337000 on the Little Missouri River near Watford City, ND" (PDF). National Water Information System. U.S. Geological Survey. 1935–2009. Retrieved March 5, 2011. ^ "USGS Gage #06926510 on the Osage River below St. Thomas, MO" (PDF). National Water Information System. U.S. Geological Survey. 1996–2009. Retrieved March 5, 2011. ^ "USGS Gage #06485500 on the Big Sioux River at Akron, IA" (PDF). National Water Information System. U.S. Geological Survey. 1929–2009. Retrieved January 10, 2012. ^ a b Kammerer, J.C. (May 1990). "Largest Rivers in the United States". U.S. Geological Survey. Retrieved October 1, 2010. ^ "Rivers". The Atlas of Canada. Natural Resources Canada. October 25, 2010. Archived from the original on April 10, 2007. Retrieved November 28, 2010. ^ Schneiders, Robert Kelley (June 5, 2011). "The Great Missouri River Flood of 2011". Bismarck Tribune. Retrieved January 14, 2012. ^ "USGS Gage #06934500 on the Missouri River at Hermann, Missouri: Monthly Average Flow". National Water Information System. U.S. Geological Survey. 1957–2010. Retrieved October 8, 2010. ^ a b "USGS Gage #06893000 on the Missouri River at Kansas City, MO" (PDF). National Water Information System. U.S. Geological Survey. 1958–2010. Retrieved January 9, 2012. 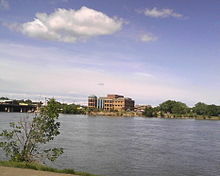 ^ "Missouri River at Great Falls, Montana". River Discharge Database. Center for Sustainability and the Global Environment (SAGE), Gaylord Nelson Institute for Environmental Studies, University of Wisconsin–Madison. Archived from the original on September 2, 2006. Retrieved January 19, 2012. ^ "USGS Gage #06440000 on the Missouri River at Pierre, SD" (PDF). National Water Information System. U.S. Geological Survey. 1934–1965. Retrieved January 19, 2012. ^ "USGS Gage #06486000 on the Missouri River at Sioux City, IA" (PDF). National Water Information System. U.S. Geological Survey. 1953–2009. Retrieved October 9, 2010. ^ "USGS Gage #06610000 on the Missouri River at Omaha, NE" (PDF). National Water Information System. U.S. Geological Survey. 1953–2009. Retrieved October 9, 2010. ^ "USGS Gage #06909000 on the Missouri River at Boonville, MO" (PDF). National Water Information System. U.S. Geological Survey. 1958–2009. Retrieved October 9, 2010. ^ "USGS Gage #06342500 on the Missouri River at Bismarck, ND" (PDF). National Water Information System. U.S. Geological Survey. 1954–2010. Retrieved January 9, 2012. ^ "USGS Gage #07010000 on the Mississippi River at St. Louis, Missouri: Peak Streamflow". National Water Information System. U.S. Geological Survey. 1844–2009. Retrieved August 24, 2010. ^ Nicholls, Elizabeth L.; Russell, Anthony P. (September 18, 1989). "Paleobiogeography of the Cretaceous Western Interior Seaway: the vertebrate evidence". Department of Biological Sciences. University of Calgary. ^ a b Love, J.D. ; Christiansen, Ann Coe. "White River Formation". Mineral Resources On-Line Spatial Data. U.S. Geological Survey. Retrieved February 12, 2011. ^ Martin, J. E.; Sawyer, J. F.; Fahrenbach, M. D.; Tomhave, D. W.; Schulz, L. D. "Arikaree Group". Mineral Resources On-Line Spatial Data. U.S. Geological Survey. Retrieved February 12, 2011. ^ Moak, William. "Pleistocene Glaciation and Diversion of the Missouri River in Northern Montana". Department of Geography and Geology. University of Nebraska, Omaha. Retrieved October 1, 2010. ^ "Missouri River". Northern State University. Retrieved October 12, 2010. ^ Moak, William. "Pleistocene Glaciation and Diversion of the Missouri River in Northern Montana". Department of Geography and Geology. University of Nebraska, Omaha. Retrieved June 28, 2011. 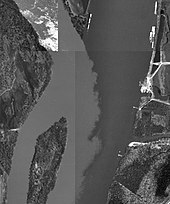 ^ "Missouri River Sediment" (PDF). Missouri River Recovery Plan Fact Sheet, U.S. Army Corps of Engineers. Missouri River Stream Team Website. Retrieved October 6, 2010. ^ a b "Missouri River Planning: Recognizing and Incorporating Sediment Management (2010)". Division on Earth and Life Studies. The National Academies. Retrieved October 7, 2010. ^ Schliefstein, Mark (September 29, 2010). "Missouri River helped build Louisiana coast, but it won't help restore it". New Orleans Net. Retrieved October 6, 2010. ^ "Days of Giants and Ice". U.S. National Park Service. Retrieved October 4, 2010. ^ "Stories Rocks Tell". U.S. National Park Service. Retrieved October 4, 2010. ^ "Knife River Indian Villages NHS". U.S. National Park Service. Archived from the original on November 29, 2010. Retrieved October 5, 2010. ^ "American Buffalo: Spirit of a Nation". PBS Nature. Retrieved October 4, 2010. ^ "Aug. 14, 1673: Passing the Missouri". Historic Diaries: Marquette and Joliet. Wisconsin Historical Society. Retrieved November 19, 2010. ^ a b c Hechenberger, Dan. "Etienne de Véniard sieur de Bourgmont: timeline". U.S. National Park Service. Retrieved January 7, 2011. ^ "The Villasur Expedition–1720". Nebraska State Historical Society. June 4, 2004. Retrieved January 19, 2012. ^ "The definitive Treaty of Peace and Friendship between his Britannick Majesty, the Most Christian King, and the King of Spain. Concluded at Paris the 10th day of February, 1763. To which the King of Portugal acceded on the same day. (Printed from the Copy.)". The Avalon Project. Yale Law School. Retrieved October 5, 2010. ^ "The Mackay and Evans Map". Lewis and Clark in the Illinois Country. Illinois State Museum. Retrieved January 23, 2012. ^ Witte, Kevin C. (2006). "In the Footsteps of the Third Spanish Expedition: James Mackay and John T. Evans' Impact on the Lewis and Clark Expedition". Great Plains Studies, Center for Great Plains Quarterly. University of Nebraska – Lincoln. Retrieved October 5, 2010. ^ "Pinckney's Treaty or Treaty of San Lorenzo". Encyclopædia Britannica. Archived from the original on October 28, 2011. Retrieved October 4, 2010. ^ "Treaty of San Ildefonso". Government & Politics. The Napoleon Series. Retrieved October 4, 2010. ^ "Louisiana Purchase". The Lewis and Clark Journey of Discovery. U.S. National Park Service. Archived from the original on November 29, 2010. Retrieved October 4, 2010. ^ "Jefferson's Instructions for Meriwether Lewis". U.S. Library of Congress. Retrieved June 30, 2006. ^ "The Mackay and Evans Map". Lewis and Clark in the Illinois Country. The Illinois State Museum. Retrieved January 6, 2011. ^ "To the Western Ocean: Planning the Lewis and Clark Expedition". Exploring the West from Monticello: A Perspective in Maps from Columbus to Lewis and Clark. University of Virginia Library. Retrieved January 6, 2011. ^ "Introduction". Lewis and Clark Expedition: A National Register of Historic Places Travel Itinerary. U.S. National Park Service. Retrieved October 5, 2010. ^ "Manuel Lisa's Fort Raymond: First Post in the Far West". Discovering Lewis and Clark. The Lewis and Clark Fort Mandan Foundation. Retrieved October 18, 2010. ^ "Fur trader Manuel Lisa dies". This Day in History. A&E Television Networks. Retrieved October 18, 2010. ^ "Post-Expedition Fur Trade: "The Great Engine"". Discovering Lewis and Clark. The Lewis and Clark Fort Mandan Foundation. Retrieved October 19, 2010. 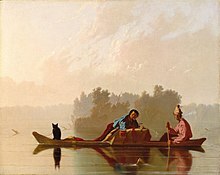 ^ "Early Exploration and the Fur Trade". U.S. National Park Service. Retrieved October 19, 2010. ^ "Fort Union Trading Post National Historic Site". Lewis & Clark Expedition. U.S. National Park Service. Retrieved February 11, 2012. ^ "The Transcontinental Railroad". History.com. History Channel. Retrieved October 7, 2010. ^ "Bridge to the Future". Kansas City Public Library. December 9, 2009. Retrieved October 7, 2010. ^ "The Great Platte River Road". Nebraska State Historical Society. June 30, 1998. Retrieved January 7, 2011. ^ "Native Americans". Transcontinental Railroad: The Film. PBS. Retrieved October 5, 2010. ^ "U.S. Army Campaigns: Indian Wars". U.S. Army Center of Military History. August 3, 2009. Retrieved October 7, 2010. ^ "Red Cloud's War (United States history)". Encyclopædia Britannica. Retrieved October 5, 2010. ^ a b Clark, Linda Darus. "Teaching with Documents: Sioux Treaty of 1868". Expansion & Reform. National Archives. Retrieved November 10, 2010. ^ "Boonville". CWSAC Battle Summaries. U.S. National Park Service. Retrieved March 5, 2011. ^ Kline, Larry (April 15, 2008). "Original Hauser Dam fell to mighty Missouri". Helena Independent Record. Retrieved December 2, 2010. ^ "Gates of the Mountains". Lewis and Clark–A Geologic Perspective. Montana Bureau of Mines and Geology. Archived from the original on February 5, 2009. Retrieved January 16, 2012. ^ a b "Canyon Ferry Dam". U.S. Bureau of Reclamation. August 10, 2010. Retrieved January 7, 2011. ^ Johnson, Marc (May 20, 2011). "Dam Politics: Could a Project Like Fort Peck Get Built Today?". New West Politics. Retrieved January 16, 2012. ^ "Flood Control Act of 1944". Digest of Federal Resource Laws of Interest to the U.S. Fish and Wildlife Service. U.S. Fish and Wildlife Service. Retrieved October 5, 2010. ^ Otstot, Roger S. (September 27, 2011). "Pick-Sloan Missouri River Basin Program: Hydropower and Irrigation" (PDF). U.S. Bureau of Reclamation. 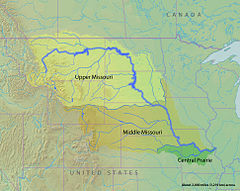 Missouri River Association of States and Tribes. Retrieved January 14, 2012. ^ "Missouri River Basin: Report of a Committee of Two Representatives Each from the Corps of Engineers, U.S. Army, and the Bureau of Reclamation, Appointed to Review the Features Presented by the Corps of Engineers (House Document No. 475) and the Bureau of Reclamation (Senate Document No. 191) for the Comprehensive Development of the Missouri River Basin". 78th Congress, 2nd Session. U.S. Congress. November 21, 1944. ^ Bon, Kevin W. (July 2001). "Upper Yellowstone River Mapping Project" (PDF). U.S. Fish and Wildlife Service. Retrieved January 14, 2012. ^ "Tribal Historical Overview - 1900s - Garrison Dam". North Dakota Studies. Archived from the original on October 7, 2011. Retrieved December 13, 2016. ^ "North Dakota: Fort Berthold Reservation". Northern Plains Reservation Aid. Retrieved December 13, 2016. ^ "Dam, Hydropower and Reservoir Statistics". United States Society on Dams. Archived from the original on March 25, 2012. Retrieved October 5, 2010. ^ "The Missouri River Mainstem". U.S. Environmental Protection Agency. April 15, 2011. Retrieved January 15, 2012. ^ MacPherson, James (January 5, 2012). "Power generation at Missouri River dams rebounds". Yahoo! News. Associated Press. Retrieved January 14, 2012. ^ Johnston, Paul. "History of the Pick-Sloan Program". World Environmental and Water Resource Congress 2006. American Society of Civil Engineers. Retrieved January 19, 2012. 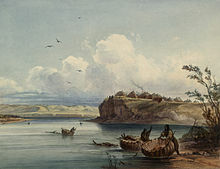 ^ "Fort Peck Dam/Fort Peck Lake". Omaha District. U.S. Army Corps of Engineers. Archived from the original on May 13, 2012. Retrieved March 16, 2011. 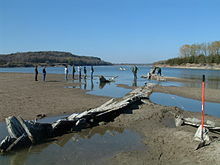 ^ "Long dry spells cut into Missouri River navigation". News Tribune. May 26, 2010. ^ a b c "Missouri River Boats" (PDF). State Historical Society of North Dakota. Retrieved January 28, 2012. ^ Carlson, Gayle F.; Bozell, John R.; Pepperi, Robert (2004). "The Search For Engineer Cantonment" (PDF). Explore Nebraska Archaeology. Nebraska State Historical Society. Retrieved January 28, 2012. ^ Handwerk, Brian (November 18, 2002). "Steamboat Wreck Sheds Light on Bygone Era". National Geographic News. p. 2. ^ "Missouri River Bank Stabilization and Navigation Project". Missouri River Mitigation Project. U.S. Army Corps of Engineers. July 21, 2004. Archived from the original on February 11, 2007. Retrieved October 7, 2010. ^ O'Driscoll, Patrick; Kenworthy, Tom (April 28, 2005). "Western drought shrinking Big Muddy". USA Today. Retrieved January 14, 2012. ^ Larson, Lee W. "The Great USA Flood of 1993". Destructive Water: Water-Caused Natural Disasters – Their Abatement and Control. National Oceanic and Atmospheric Administration. Retrieved January 14, 2012. ^ a b "Blame game as rising river nears SD homes: Some residents say corps erred in not releasing water sooner". MSNBC. June 3, 2011. Retrieved January 14, 2012. ^ "Missouri River Mitigation Project". U.S. Army Corps of Engineers. July 21, 2004. Archived from the original on June 27, 2007. Retrieved October 7, 2010. ^ a b "Missouri River Navigation: Data on Commodity Shipments for Four States Served by the Missouri River and Two States Served by Both the Missouri and Mississippi Rivers" (PDF). U.S. Government Accountability Office. January 15, 2009. Retrieved October 7, 2010. 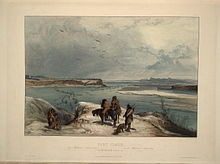 ^ a b c "The Missouri River: A view from upstream". Prairie Fire. December 2007. Retrieved October 7, 2010. ^ "Missouri River Dam Reforms and Navigation" (PDF). Environmental Defense Fund. Archived from the original (PDF) on December 1, 2008. Retrieved January 18, 2011. ^ "About the Upper Mississippi River System". U.S. Geological Survey, Upper Midwest Environmental Sciences Center. March 13, 2014. Retrieved September 19, 2014. 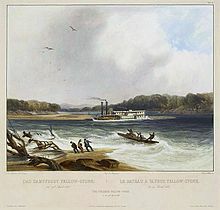 ^ "Upper Mississippi River navigation season ending". Milwaukee Journal Sentinel. Associated Press. November 30, 2012. Retrieved September 19, 2014. ^ Yu, Tun Hsiang; Fuller, Stephen (October 2002). "Factors Affecting Lock Delay on the Upper Mississippi and Illinois Rivers and Effect of Lock Delay on Barge Rates" (PDF). Texas A&M University. pp. 3–4. Retrieved September 19, 2014. ^ "The Missouri River System's "Other" Fish". Northern Prairie Wildlife Research Center. August 3, 2006. Archived from the original on September 17, 2008. Retrieved October 8, 2010. ^ a b Kendle, Earl R. (November 9, 1970). "The Effects of Channelization in the Missouri River on Fish and Fish-Food Organisms". Nebraska Game and Parks Commission. Digital Commons @ University of Nebraska, Lincoln. Retrieved October 20, 2010. ^ "Executive Summary". U.S. Fish and Wildlife Service Biological Opinion on the Operation of the Missouri River Main Stem Reservoir System, Operation and Maintenance of the Missouri River Bank Stabilization and Navigation Project, and Operation of the Kansas River Reservoir System. U.S. Army Corps of Engineers. Retrieved January 19, 2011. 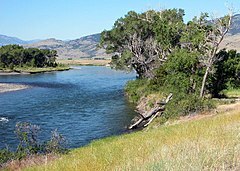 ^ "Missouri River tops annual rating of threatened waterways". U.S. Water News. May 2001. Archived from the original on June 8, 2001. Retrieved March 11, 2014. ^ "Missouri River Planning Report". National Research Council. 2010. Retrieved July 22, 2011. ^ "Missouri River Planning Report in Brief". Division on Earth & Life Studies. National Research Council. 2010. Retrieved July 22, 2011. ^ "Lewis and Clark National Historic Trail". U.S. National Park Service. Retrieved October 11, 2010. ^ "Lewis and Clark National Historic Trail" (PDF). National Parks Conservation Association. p. 1. Archived from the original (PDF) on November 28, 2008. Retrieved October 11, 2010. ^ "Canoeing and Kayaking". U.S. National Park Service. Retrieved October 11, 2010. ^ "Missouri National Recreational River". U.S. National Park Service. Retrieved October 11, 2010. ^ "Missouri National Recreational River Water Resources Information and Issues Overview Report" (PDF). U.S. National Park Service. Retrieved October 11, 2010. ^ "Charles M. Russell National Wildlife Refuge". U.S. Fish and Wildlife Service. Retrieved October 11, 2010. 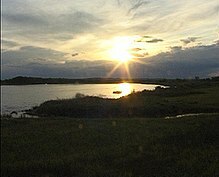 ^ "Charles M. Russell National Wildlife Refuge Overview". U.S. Fish and Wildlife Service. Retrieved October 11, 2010. ^ "Nature & Science". Niobrara National Scenic River. U.S. National Park Service. May 28, 2009. Retrieved October 12, 2010. 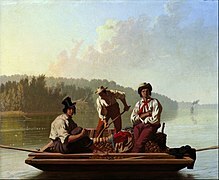 ^ "Three Forks of the Missouri". Lewis and Clark Expedition. U.S. National Park Service. Retrieved February 24, 2011. ^ "Fort Atkinson". Lewis and Clark Expedition. U.S. National Park Service. Retrieved March 3, 2011. ^ "Arrow Rock State Historic Site". Missouri State Parks. Retrieved March 3, 2011.